You've made changes to your project schedule and now the end date has moved out too far. To fix the end date of the project, adjust the tasks that impact the end date the most. These tasks lie on the critical path of the project. For more articles in this series of project management instructional guides, see The Project Road Map. When you make changes to your schedule, there are three factors you need to look at: cost of the project, scope of deliverables, and time. These are often shown as a triangle. You can’t change one point of the triangle without affecting the others. Here are examples of what this means for your project end date. When you bring in the scheduled end date, you might end up with increased costs and decreased scope. If you plan on never changing the costs of the project, the result might be a longer schedule and a decreased scope. If you increase scope or the number of deliverables, your project might take more time and cost more money with extra workers or resources. If you’re new to project management No matter how well you plan a project, things will go wrong. Start looking for problems now rather than later when things could get much worse. Here are a few ways to get you started monitoring and fixing your project. Look at the most important tasks first Some tasks are more important than others when you need to resolve problems in your project. The tasks that impact the schedule the most are the critical tasks and are the ones you need to pay the most attention to. Get the right view of your project Project has numerous views and reports to help you figure out what’s wrong with your project. 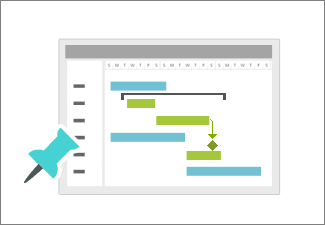 For simple projects, keep a careful eye on the project’s end date using the Gantt chart. For complicated projects, check the variance tables or earned value reports. Get weekly status reports It’s not easy for people to send in work status reports. Simple ways to get status would be during weekly team meetings. Collecting status more frequently than weekly can be counterproductive. If you’re a seasoned project manager You’ve been a project manager for a long time, but now you’re faced with a project that needs close monitoring to stay within budget. Plus, your sponsor says she wants executive reports on a monthly basis. Here are a few things to get you started monitoring, reporting and fixing your project. Create a baseline for your project After you’ve created your schedule, save a baseline version. A baseline is an original version of your project that you can use to compare against the progress of your tasks. Get the right view of your project Project has numerous views and reports to help you figure out what’s wrong with your project. As projects get more complicated, look at variance tables or earned value reports to see what’s wrong. Get weekly status reports As projects get more complicated, you can use more sophisticated methods to collect weekly status reports. Team members can enter status information in a SharePoint task list, which can then be sync’d with Microsoft Project. If you’re using Project Professional, you can also use Project Web App to collect status reports from your team. Collecting status more frequently than weekly can be counterproductive. Understand earned value analysis Earned value analysis helps you determine if your project is on track. View task updates from team members to learn where problems are. You can track progress quickly using the Gantt chart, or you can use a sophisticated earned-value analysis. This helps you see whether work on your project is progressing as expected. Learn how your project is being scheduled. You can see how changes to the task schedule affect the finish date of your project. Show tasks that have the greatest impact on the project end date. Look at these tasks first to fix problems in your schedule. Use the views and reports in Project to detect where the problems might be and to help make changes to the schedule. To start over with your tracking, start a new baseline to compare future progress. Create and customize graphical reports of project progress. View these reports in Project or export them to other applications like PowerPoint, Word, or Excel. Earned value helps you answer questions like, “Looking at the amount of work done so far in this project, how much money were we supposed to have spent?” or "Will we finish on time?" Choose a date that begins or finishes on a date that is earlier than the date of the current plan. If this is an option for your project, try changing the start date first. Reduce task durations to bring in the end date. Make sure you’re reducing task durations for critical tasks that have the greatest impact on the project end date. When people are working on too many assignments at the same time, let Project distribute work more evenly by leveling resource assignments. You can split a single task if it comprises multiple elements that can be worked on simultaneously by different resources. If you break a critical path task into these different elements with different assignments, you might be able to meet the finish date. Add people to work on tasks that are pushing out the end date. Removing people from tasks is another way to bring in the end date of the project. Too many people on a task, or the wrong people, can create communication problems that can increase the task duration. You can bring in the end date of the project by changing people’s work calendars. You can add additional work days to people’s schedules, or have them work overtime. Get Project questions answered by experts. The Project forum on Answers.com has experienced users as well as Project consultants ready to answer your questions. After you’ve made changes to a person’s schedule, communicate those changes so information doesn’t get lost. Any change in a project comes at the expense of time, money, or scope. These are the factors you juggle every day to keep your Project plan on track. Learn how to work with these constraints. As Project adjusts your schedule, tasks might move around unexpectedly. Understand the big “Why?” behind Project’s powerful scheduling engine.